As publicity stunts go, this one is rather novel. Jaguar can’t help but flaunt its partnership with the Championships at the Wimbledon 2017 tennis tournament. After using the world-famous Wimbledon tennis court to sketch out a preview design of the new XF Sportbrake, new images have emerged showing the upcoming Audi A6 Avant rival out in the wild wrapped in colorful camouflage plastered with images of tennis balls. As publicity stunts go, though, the backstory for this one is rather novel. And it all started on social media, of course. A Scottish fan tweeted to tennis star Andy Murray suggesting the remote Bunabhainneadar Tennis Court on the Scottish island of North Harris should be added to the ATP World Tour. Murray couldn’t believe it was real, so he arranged for fellow tennis player Tim Henman, who also happens to be a brand ambassador for Jaguar, to drive the fan to the remote location in a prototype XF Sportbrake to prove its existence. "The Bunabhainneadar Tennis Court looks unreal, so I can see why Andy doubted Susan’s original message,” said Henman. "The road to the court was the perfect place to try out the new XF Sportbrake as it mixes amazing scenery with some challenging corners." I can’t wait to drive the car again – perhaps a bit closer to home.” These fresh images provide the best look at the XF Sportbrake yet ahead of its reveal, and unsurprisingly it looks virtually the same as the XF sedan, apart from the addition of a full-length panoramic roof and of course a larger trunk offering better luggage space. 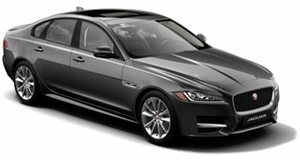 Jaguar says the new XF Sportbrake will be the "most dynamic premium estate car in the world" that combines “traditional Jaguar design and agility with a spacious and practical interior.” Expect the same engine range as the XF sedan, including a hot 3.0-liter S model with a supercharged V6 producing 375 horsepower. We can only hope that an even more savage SVR model will follow as a successor to the XFR-S Sportbrake. The Jaguar XF Sportback will make its official debut at Wimbeldon on June 14 where it will be revealed by Andy Murray.